Process reengineering is redesigning or reinventing how we perform our daily work, and it is a concept that is applicable to all industries regardless of size, type, and location. While selected elements of process reengineering are well documented in the late 1800s and early 1900s, process reengineering as a body of knowledge or as an improvement initiative, takes the best of the historical management and improvement principles and combines them with more recent philosophies and principles, which make all people in an organization function as process owners and reinvent processes. It is this combination of the old and the new as well as the emphasis on dramatic, rapid reinvention that makes process reengineering an exciting concept. 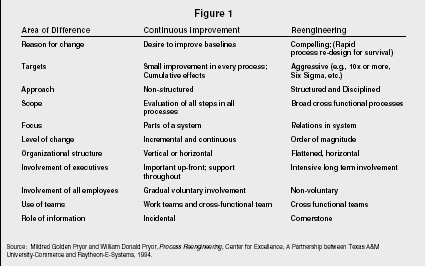 The differences between continuous process improvement and process reengineering are outlined in Figure 1. The first question in process reengineering is: "Why are we doing this at all?" Answering this question is the beginning of the immediate, dramatic change and the application of supporting technical and behavioral concepts and tools that are necessary to implement process reengineering. To accomplish this, organizations must foster an environment that encourages quantum leaps in improvement by throwing out existing systems and processes and inventing new ones. The intent of process reengineering is to make organizations significantly more flexible, responsive, efficient, and effective for their customers, employees and other stakeholders. According to field experts Michael Hammer and James Champy, process reengineering requires the "fundamental rethinking and radical redesign of business processes to achieve dramatic improvements in critical, contemporary measures of performance, such as cost, quality, service, and speed." If process reengineering is to work, a business's priorities must change in the following ways: (1) from boss to customer focus; (2) from controlled workers to empowered, involved process owners and decision makers; (3) from activity-based work to a results orientation; (4) from scorekeeping to leading and teaching so that people measure their own results; (5) from functional (vertical) to process (horizontal or cross functional) orientation; (6) from serial to concurrent operations; (7) from complex to simple, streamlined processes; (8) from empire building and guarding the status quo to inventing new systems and processes and looking toward the future (i.e., from the caretaker mentality to visionary leadership). Source: Mildred Golden Pryor and William Donald Pryor, Process Reengineering, Center for Excellence, A Partnership between Texas A&M University-Commerce and Raytheon-E-Systems, 1994.
they will be able-individually and as members of teams-to contribute positively to make the organizational vision a reality. There are several reasons for organizations to reengineer their business processes: (1) to re-invent the way they do work to satisfy their customers; (2) to be competitive; (3) to cure systemic process and behavioral problems; (4) to enhance their capability to expand to other industries; (5) to accommodate an era of change; (6) to satisfy their customers, employees, and other stakeholders who want them to be dramatically different and/or to produce different results (7) to survive and be successful in the long term; and (8) to invent the "rules of the game." Whatever the reason for reengineering, managers should ask themselves: What do our customers and other stakeholders want/require? How must we change the processes to meet customer and other stakeholder requirements and be more efficient and effective? Once streamlined, should the processes be computerized (i.e., how can information technology be used to improve quality, cycle time, and other critical baselines)? Processes must be streamlined (i.e., re-invented) before they are computerized. Otherwise, the processes may produce results faster, but those results may not be the ones needed. Initiation from the top by someone with a vision for the whole process and relentless deployment of the vision throughout the organization. Leadership that drives rapid, dramatic process redesign. A new value system which includes a greater emphasis on satisfying customers and other stakeholders. A fundamental re-thinking of the way people perform their daily work, with an emphasis on improving results (quality, cycle time, cost, and other baselines). An emphasis on the use of cross-functional work teams which may result in structural redesign as well as process redesign. Enhanced information dissemination (including computerization after process redesign) in order to enable process owners to make better decisions. Training and involvement of individuals and teams as process owners who have the knowledge and power to re-invent their processes. A focus on total redesign of processes with non-voluntary involvement of all internal constituents (management and non-management employees). Rewards based on results; and a disciplined approach. Not focusing on critical processes first. Trying to gradually "fix" a process instead of dramatically re-inventing it. Making process reengineering the priority and ignoring everything else (e.g., strategy development and deployment, re-structuring based on new strategies, etc.). Neglecting values and culture needed to support process reengineering and allowing existing culture, attitudes, and behavior to hinder reengineering efforts (e.g., short-term thinking, bias against conflict and consensus decision making, etc.). "Settling" for small successes instead of requiring dramatic results. Stopping the process reengineering effort too early before results can be achieved. Placing prior constraints on the definition of the problem and the scope for the reengineering effort. Trying to implement reengineering from the bottom up instead of top down. Assigning someone who doesn't understand Reengineering to lead the effort. Dissipating energy across too many Reengineering projects at once. Attempting to reengineer when the CEO is near retirement. Concentrating primarily on design and neglecting implementation. Pulling back when people resist making reengineering changes (not understanding that resistance to change is normal). Source: Mildred Golden Pryor and William Donald Pryor, Process Reengineering, Center for Excellence, A Partnership between Raytheon E-Systems and Texas A&M University-Commerce, Texas, 1994. Intensification-improving/re-inventing processes to better serve customers. Extension-using strong processes to enter new markets. Augmentation-expanding processes to provide additional services to existing customers. Conversion-using a process that you perform well and performing that process as a service for other companies. Innovation-applying processes that you perform well to create and deliver different goods and services. Diversification-creating new processes to deliver new goods or services. Process reengineering is a valuable concept for organizations that are willing to undergo dramatic change and radical process redesign. It can co-exist with ongoing gradual process improvement efforts because not all processes can be radically redesigned at once. In process reengineering, as in all improvement initiatives, assessments should be made in terms of cost/benefit analysis, and risk analysis. However, even the assessments should be done with a sense of urgency since process reengineering requires speed as well as radical redesign. Documentation of results will serve as the baseline for future improvements. The various improvement methodologies (i.e., continuous improvement and process reengineering) should not be used as separate efforts but rather as two approaches within a single improvement initiative. 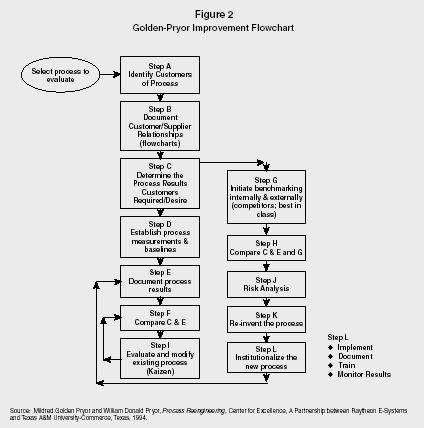 In fact, a single flowchart can be used to make choices regarding both continuous process improvement and process reengineering (see Figure 2). Both gradual continuous improvement and process reengineering should be an integral part of process management. Bossidy, Larry, and Ram Charan. Execution: The Discipline of Getting Things Done. New York, NY: Crown Publishing Group, Random House, 2002. Champy, James. Reengineering Management. New York, NY: HarperCollins Publishers, 1995. ——. X-Engineering the Corporation: Re-inventing Your Business in the Digital Age. New York, NY: Warner Business Books, 2001. Davenport, Thomas H. "Need Radical Innovation and Continuous Improvement? Integrate Process Reengineering and TQM." Planning Review, May-June 1993, 7–12. ——. Process Innovation. Boston, MA: Harvard Business School Press, 1993. Hammer, Michael. The Reengineering Revolution. New York, NY: HarperCollins Publishing, 1996. ——. "Reengineering Work: Don't Automate, Obliterate." Harvard Business Review, July-August 1990, 104–112. Hammer, Michael, and James Champy. Reengineering the Corporation. New York, NY: Harper Business Publisher, 1993. Hengst, Marielle den, and Gert-Jan de Vreede. "Collaborative Business Engineering: A Decade of Lessons from the Field." Journal Of Management Information Systems 20, no. 4 (Spring 2004): 85–113. Kinni, Theodore. "A Reengineering Primer." Quality Digest, January 1994, 26–30. Kumar, Sameer, and Ralph Harris. "Improving Business Processes for Increased Operational Efficiency: A Case Study." Journal Of Manufacturing Technology Management 15, no. 7 (2004): 662. Petroski, Henry. "Look First to Failure." Harvard Business Review 82, no. 10 (October 2004): 18. Pryor, Mildred Golden, and Donald W. Pryor. "Process Reengineering as a Quality Strategy." Israel Society For Quality Proceedings, November 1994, 681–696. ——. Process Reengineering Training Manual. Commerce, TX: Center for Excellence, 1994. Reijers, H.A., and S. Liman Mansar. "Best Practices in Business Process Redesign: An Overview and Qualitative Evaluation of Successful Redesign Heuristics" OMEGA 33, no. 4 (August 2005): 283. Roberts, Lon. Process Reengineering: The Key To Achieving Breakthrough Success. Milwaukee, WI: ASQ Press, 1994. Young, Martha, and Michael Jude. "Business Process Virtualization, Outsourcing and Process Reengineering." Cisco Press. Available from < http://www.informit.com/articles/article.asp?p=169681 >.